It’s only fitting that when a famous bookstore throws a party, that some famous authors will show up. 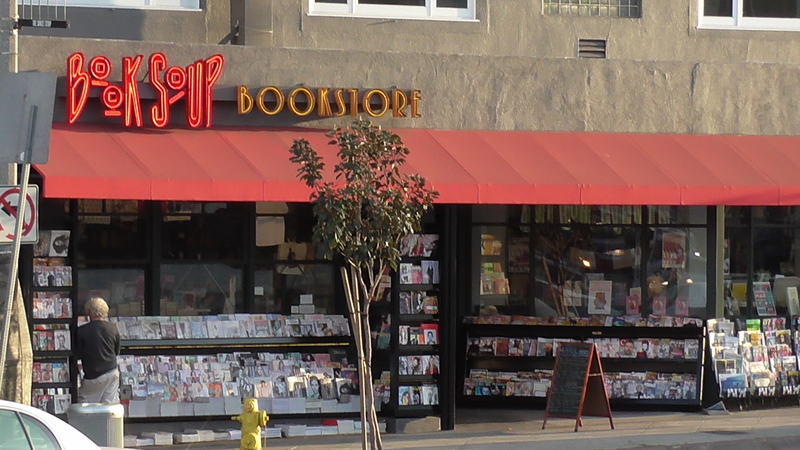 Book Soup, the Sunset Strip’s fortress of literature, held their 40th Anniversary party on Friday, June 12, 2015. Many of L.A.’s favorite writers showed up to show their support and many gave readings. In the spirit of camaraderie, the authors did not read from their own books, but from their favorite current books written by other authors. The evening’s events started with Paul Neuman, Director of Communications for Los Angeles Councilmember Paul Koretz reading a Proclamation from the City of Los Angeles to Book Soup. This is probably the most humorous piece of literature that the City has ever issued, and you can hear it being read on the video of the event. Don’t miss this, it’s a treasure. 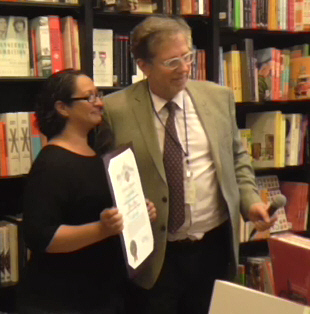 The Proclamation was accepted by Jennifer Ramos, who is head of events for Book Soup and Vromans Book Store in Pasadena. Next was the vivacious Pam Ward, a Los Angeles poet, writer, and graphic designer. 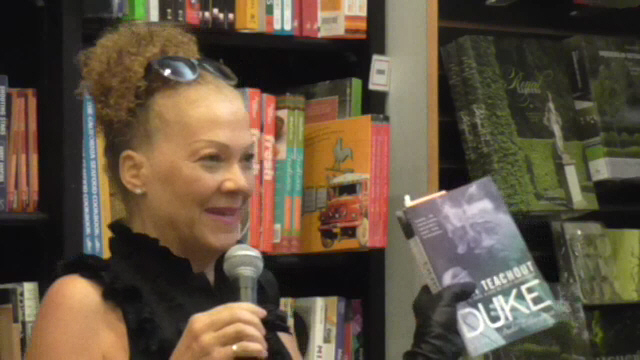 She read from “Duke: A Life of Duke Ellington” by Terry Teachout. Ward related some incidents about her aunt and Duke Ellington, focusing on Ellington’s legendary sexual prowess. Ward said that The Duke would rent 6 motel rooms for the night and put a different lady in each one, and then spend the night moving from room to room. Her spicy off the cuff remarks and reading had the audience in stitches. 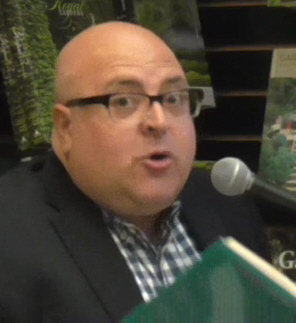 Frank DeCaro, Sirius XM radio host, writer (“Dead Celebrity Cookbook”) and comedian read from “Candy at Last”, by Candy Spelling, the uber-rich widow of Hollywood Producer Aaron Spelling. DeCaro is a really funny guy, and he relates his own issues with food and overeating with Candy Spelling’s self-absorbed, maxed-out fixation on her own body and eating habits. Her book might be a big seller in Beverly Hills, which hosts armies of obnoxious, narcissistic men and women, but probably not in the farming flatlands of Indiana, where one bookseller is offering a used copy of her book for 24 cents (plus shipping). Another funnyman and author, Tony DuShane, read from master of illustration Ralph Steadman’s book “The Joke’s Over: Bruised Memories: Gonzo, Hunter S. Thompson and Me.” Steadman was a long-time illustrator of Hunter Thompson’s books and articles in Rolling Stone Magazine in the 1970s. Steadman has a lot of memories of the weird times with Thompson, and DuShane read from an incident where Thompson finally convinces Steadman to try some drugs he happens to have, and the disastrous results that ensued. Tony DuShane is the author of “Confessions of a Teenage Jesus Jerk”, a writer for the San Francisco Chronicle, a radio host and a writing instructor at UCLA Extension. 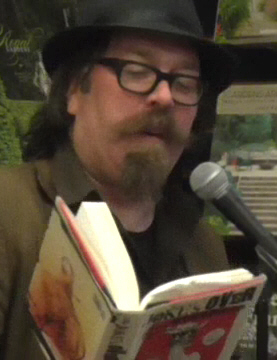 Afterward, we had a nice chat about Hunter Thompson. I had met him and interviewed him way back in the early 1970s, and the stories of his alcoholism (he loved gin and grapefruit juice), and speed (he sometimes carried around a bag of whites to give him a lift when needed) was not exaggerated. I was totally amazed over the years, not only that he could write so well when he was stoned out of his mind, but that he actually lived as long as he did. As to Ralph Steadman, DuShane and I both consider him to be one of most creative guys alive today. 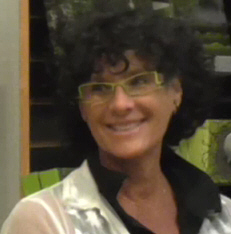 Meredith Maran is a major journalist and author. She has written for every major magazine you can think of, and has put out 10 non-fiction books and a novel. She read from “Just Kids” by Patti Smith, which is about Smith’s relationship with photographer Robert Mapplethorpe. Singer-songwriter Patti Smith has been called the poet laureate of the Punk Rock movement. Ms Maran’s reading covered a touching period in Smith’s life, dealing with the impending death of Mapplethorpe, a man she was so deeply in love with. 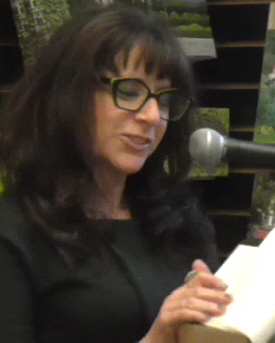 If you weren’t able to be part of the enthusiastic crowd at Book Soup that night, no problem, just click on the box below to see the entire event. You’ll have to provide your own chocolate cake and wine, though. Your punishment for not showing up at the live event. Or, you can go to youtube.com and see it, click here. This entry was posted in Books, Celebrities, Events, General, Hollywood People and tagged 40 Anniversary, Beth Lapides, Book Soup, Frank DeCaro, Meredith Maran, Pam Ward, Tony DuShane. Bookmark the permalink.